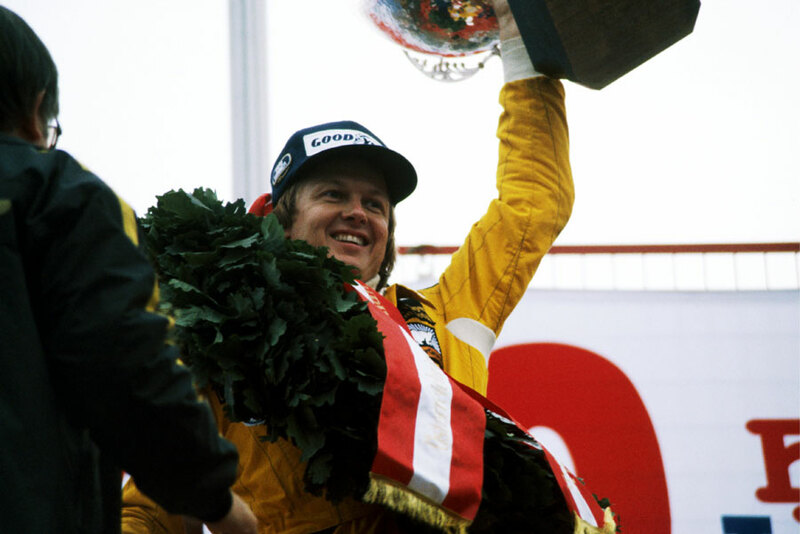 Ronnie Peterson won the Austrian Grand Prix after a chaotic start caused by a sudden downpour just as the race was about to get underway. With several cars on slicks, the result was almost farcical as they aquaplaned on a flooded track, and championship leader Mario Andretti was one of those to crash out. Almost inevitably, Andretti and Peterson qualified at the front of the grid and few expected anything other than Andretti to lead home the pair of Lotuses and in so doing all but secure himself the title. But as storm clouds gathered over the Österreichring there was frantic activity as teams tried to work out which tyres to use. Those who opted not to go with wet-weather options paid dearly as the rain bucketed down within seconds of the start. Peterson pulled away to build a big gap with Patrick Depailler's Tyrrell in second ahead of Jody Scheckter's Wolf. But behind them those on slicks found it all but impossible to stay on the track. Andretti skidded off on the first circuit and then could only watch as a lap later Scheckter slammed into the abandoned Lotus. After eight laps the race was stopped, much to Peterson's relief as he had gone off on the final lap. The stewards decided to allow all those who had skidded off to take their place at the re-start, but Andretti's Lotus was beyond repair. At the re-start there was still uncertainty over tyres, and Peterson quickly pitted to change to slicks, allowing Carlos Reutemann to take the lead. Peterson resumed, roared back to pass Gilles Villeneuve and Reutemann, and after that his only brief challenge came from Nikki Lauda until he crashed his Brabham on the 21st lap. "I drove too quickly into the corner," he explained. Reutemann had his own spin, and the push start he received from a marshal earned him a black flag and exclusion as a result, and an almost identical fate befell Hans Stuck. Patrick Depailler finished second with Gilles Villeneuve third. While Peterson's win was welcomed within Lotus, it meant that the gap between him and Andretti was cut to nine points. At the post-race press conference, an angry Peterson reacted angrily to questions as to his role as the No. 2 driver at Lotus. "I have been saying all along I'm just as good a bet for the world championship as Mario, so maybe people will start believing in me now."